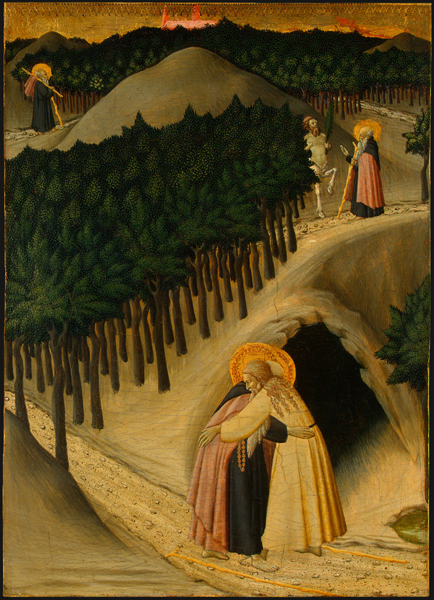 The chronological reversal in The Meeting of Saint Anthony and Saint Paul (see interactive) would seem to ignore Dolce’s admonition that painters “should not place later in time what ought to come earlier, nor earlier what should come later.” Nonetheless, the greater freedom of the eye in surveying a picture (in contrast to the predetermined order of processing a verbal narrative) allows the (re)reading of the painting from back to front in proper chronological order. Either way, the narrative remains essentially linear and sequential as laid out. Other fifteenth-century painters took greater liberties, experimenting with increasingly challenging narrative paths. 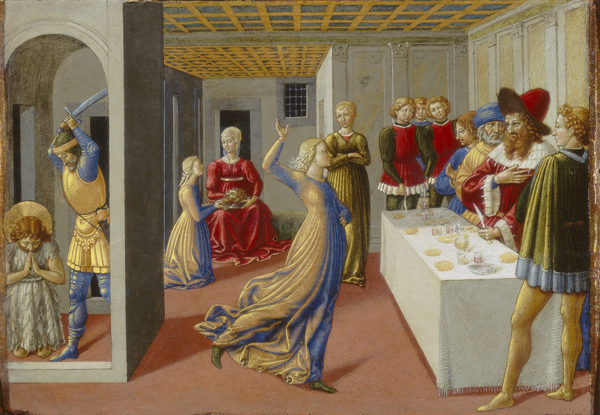 Time follows a comparatively erratic trajectory in The Feast of Herod and the Beheading of Saint John the Baptist, painted around 1461–2 by Benozzo Gozzoli. Read chronologically, the narrative pings around like a pinball, moving from Salome’s dance at the center, to Herod’s reaction at far right, to Saint John’s execution at far left, to Herodias’s vengeful triumph in deep space. But we are not restricted to reading the incidents chronologically—back and forth and into pictorial depth. We can also read in a quasi-literary fashion from left to right, beginning with the execution scene and moving on to a flashback of Salome’s dance and Herod’s response. A third possibility is offered by the doubled figure of Salome, whose appearance in both foreground and background establishes a direct link between the beginning and the end of the story. The dramatically receding diagonal lines of the composition reinforce that connection. Converging at the window to the right of Herodias, the lines draw our attention irresistibly from the foreground (where the narrative begins) to the background (where we see the tragic conclusion of the story). Here, as in The Meeting of Saint Anthony and Saint Paul, continuous narrative provides a providential perspective, creating the impression that the circumstances, though revealed to the participants sequentially, are in fact part of a divine scheme, foreordained and inevitable from the start.